In court documents, the Navy said the uncertainty of the company’s radiation cleanup work has caused a complete loss of trust in the Navy by the local community. New federal court documents obtained by the NBC Bay Area Investigative Unit reveal the Navy believes it suffered a massive hit to its reputation as a result of the fraud committed by Justin Hubbard, a former employee of Tetra Tech, the company it hired to clean up radiation at the Hunters Point Shipyard in San Francisco. The site is slated for parks, shops and thousands of homes. Duchnak estimates it has set back the planned transfer of the property by a decade. She said the delay has caused “ire and frustration” by San Francisco city officials, members of congress and local activists. The scandal has brought on “negative media attention” and caused residents who moved into new condos next to where the cleanup is taking place to worry about their safety, she said. “The development of [the Hunters Point Shipyard] was supposed to revitalize the community and provide jobs and affordable housing; all of that is now on hold indefinitely as the Navy and the regulatory agencies have determined that Tetra Tech’s work is unreliable,” Duchnak said. Earlier this year, after reviewing of all of Tetra Tech’s radiation cleanup records, the Navy found nearly half of the data had inconsistencies and that much of it was likely fraudulent. The Navy is now coming up with a plan to resample the entire shipyard for radiation, essentially redoing of all of Tetra Tech’s work. The Navy paid $272 million to Tetra Tech for 12 years of work. Duchnak said the cost of the required rework is likely to rise as high as $578 million. That amount of money would buy a new combat ship, she said. Duchnak said the scandal has caused regulatory agencies to lose trust in the Navy’s ability to implement its radiological remediation program, and that the EPA no longer has confidence in the work performed by Tetra Tech. A federal judge sentenced Hubbard and fellow radiation technician supervisor Stephen Rolfe to eight months in prison on Thursday for falsifying cleanup records. Both men admitted to substituting clean dirt for the soil samples they were supposed to be testing in an effort to fake the results of the cleanup. According to court records, a health physicist for the EPA wrote in a declaration that when the suspect areas were resampled, it was determined that “excessive levels of radiation remained after fraudulently being deemed clean by Tetra Tech employees,” including Hubbard.” The areas were subsequently cleaned up. 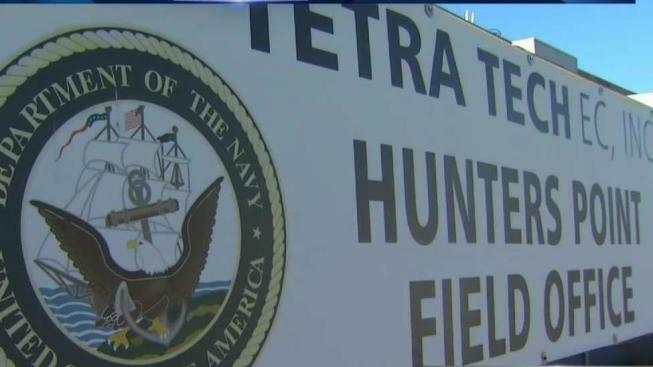 NBC Bay Area Investigative Unit first exposed in 2014 that the Navy caught Tetra Tech mishandling soil samples and falsifying data, and that the company disciplined two supervisors and retrained workers. At the time, the company said it took corrective action and had not had a recurrence of fake soil samples. While Hubbard and Rolfe are the only two Tetra Tech employees who have pleaded guilty to falsifying federal records, court documents explain that the investigations had been pending for a number of years and involve “a number of other targets.” It is unclear if investigators are looking into other employees. In court records, Hubbard’s attorney said he made a “grievous error” while working far from his Boulder City, Nevada home and that he was “lonely, tired and discouraged with a difficult crew that had to be hired from several zip codes in the immediate vicinity of Hunters Point.” He said Hubbard regrets what he did every single day. He no longer works in the remediation industry. A company spokesperson told NBC Bay Area on Thursday that Tetra Tech supports the action of the Department of Justice. “Tetra Tech vehemently rejects this type of activity and will pursue all legal actions available to it to recover the harm that the actions of these former employees have caused to Tetra Tech, the Navy, and the local community. We have zero tolerance for violations of established protocols and procedures on any project site,” the company wrote in a statement.